At the Gutu Primary School in West Arsi, Ethiopia, students had no safe water. If they wanted water to drink or wash, they walked several hundred yards away to a pond or stream and dipped their bottles into it. 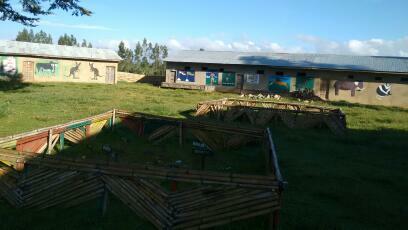 For over 1000 students, there were 4 latrines, which used to be unkempt holes in the dirt. There was no place to wash their hands. It was gross and it made them sick. In fact, in their region, 100% of the students reported cough or difficulty breathing and many reported stomach pain/diarrhea or skin and eye infections. (And those were the ones who made it to school!) These are all illnesses that can be prevented with good water, sanitation, and hygiene (WASH). Construction is in process at Gutu Primary School (above). Updated photos of completed latrines and well to come. Thanks to you, parents, teachers, and students are all working with Lifewater to establish a WASH in Schools program at Gutu Primary School. This means they’ll receive a new source of safe water close to school, blocks of sturdy latrines where they can be safe and clean, and plenty of places to wash their hands. They’ve even started a WASH club, where student leaders teach and encourage others to practice good sanitation and hygiene. They’ll be safer. They’ll be healthier. They’ll be dignified. They’ll be learning. And all because you gave your birthday. Happy Birthday indeed! On behalf of the students at Gutu Primary – THANK YOU. This could not happen without these amazing Birthday fundraisers (listed below) and all of their family and friends who gave generously. Celebrating our Birthday Fundraisers in April, May, and June.